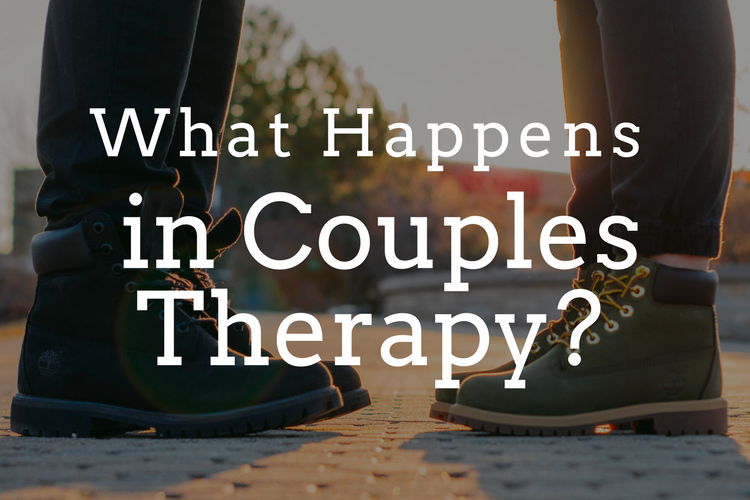 Wondering what happens in couples therapy? You’re having a having a hard time in your relationship. You know you and your partner could use some help but you’re nervous about starting counseling. Starting couples therapy can feel a bit daunting. You’re about to tell a complete stranger, your therapist, all about your relationship – the good, the bad and ugly. For some, having a rough blueprint of what actually happens in couples counseling can calm some of that first session anxiety. There are 3 general areas that your first appointment will focus on: The present, the past and the future. Your couples therapist will begin by asking each of you to talk about what you want help with. You will have had a chance to talk a bit about this when you book your first session and you’ll think about it when you complete the paperwork we will ask you to fill out before you come in. But once you and your partner are sitting on the couch in front of your therapist, you’ll be invited to go deeper into the stuck places in your relationship. Defining the problem, or articulating what you need help with, serves multiple functions. Of course, it helps your therapist begin to get to know you and your relationship. But it also helps you gain clarity about what is really bothering you in the relationship. Are you sick of arguing? You’ll each have an opportunity to talk about what’s bothering you. When you partner describes what is bothering them about the relationship, you might hear something new or different, notice that it’s hard to listen or realize that you have two very different perspectives about what’s going on in the relationship. This is common at the beginning of couples therapy. You’ll also talk about your strengths as a couple. What do you appreciate about your partner? When things are going well between you two, what’s working? Every couple is unique. Maybe you and your sweetie laugh a lot or maybe you’re great at having shared adventures together. Maybe you’re strong as a couple when a crisis hits or are solid supports for each other around your careers. It’s important to talk about what does work because this will help guide you to think about how to build on those strengths. What drew you to each other when you first met? What were the early days of your relationship like? Have there been things that have been pushed under the rug? By the time most couples get into therapy, some hard things have accumulated. It’s important to uncover these so you can begin to process them and move on. You’ll also be asked to talk some about what it was like for you growing up. Our early relationships – with your parents or whoever was your primary caregiver, creates a blueprint for later relationships. What did you learn growing up about love and trust? What did you learn about sharing your emotions? The lessons about love, trust and emotional vulnerability that we learned when we were young will inevitability show up in our adult relationships. The point of exploring some of your family history isn’t to blame your parents, or to make everything about your past, but to increase compassionate understanding of why you are the way you are in your relationship today. Because if we can’t talk about the past, we can’t talk about the future. You’ll also be asked about the future. Would you like to argue less? Learn how to talk about difficult topics? Make a deeper commitment to each other? Pondering these questions will help you think about your goals for relationship counseling so you and your partner have a blueprint of what you’re working towards. Sometimes couples start therapy uncertain about what the future holds for them. This is normal and something your couples therapist will help you talk about. Starting therapy to work on your relationship takes courage: the courage to move towards what hurts instead of avoiding it and the courage to hope that your love can deepen and grow stronger. Are you ready to start improving your relationship? Contact us today to set up your first appointment. We can answer any questions you may still have about what happens in couples therapy and match you with the right therapist. Our offices are located in the Castro district of San Francisco.